In case you are too young to remember, Making Things Grow aired on PBS from 1966-1969. Although highly educational, the program was never boring. I well remember how she divided a Boston fern, as if she was killing a vampire. “Sometimes you must be brutal,” she hissed, while stabbing at the plant’s roots. On another episode, she feigned horror when she discovered a slug in one of her houseplants. She flicked the slimy pest onto her work counter, and then, after warning squeamish viewers to avert their eyes, she lifted a clay pot over her head, and smashed it down on the offending creature. Hey, what kid wouldn’t take up gardening after viewing such antics? Following her TV show, Cruso authored several books. 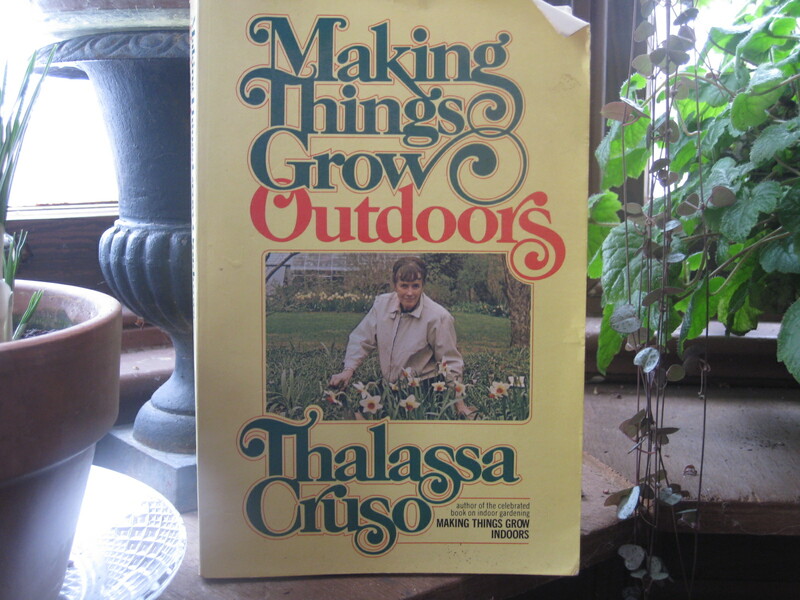 Making Things Grow Outdoors was published in 1971. Here, she offers practical and humorous advice for designing and maintaining a garden. Her tips for composting, and for dealing with pests without chemicals, are still timely today. A used, paperback copy of this book is up for grabs. Would you like to win it? First, post a comment below. Tell me who your garden guru is (or was). Be sure to include at least part of your email address at the end of your comment, so that I can quickly verify that you’ve subscribed to my newsletter. Next, subscribe — if you haven’t already — to my weekly email newsletter. Finally, join A Garden for the House on Facebook, by clicking the “like” button at the top of that page. Be sure to comment, subscribe, and “like” soon…this drawing ends February 5 at 11:59 PM. As always, I’ll use the nifty gadget at Random.org to select a winner. Don’t miss anything at A Garden for the House…sign up for Kevin’s free, weekly newsletter! Kevin, I'd have to say my grandmother was my gardening guru. She showed me how to plant Cosmos seeds when I was little, and I have not stopped gardening since. I'm already on your FB page, and have subscribed to your newsletter. My father was my gardening guru. He grew such great things for my mother to cook. Great Cajun food! My garden guru was my uncle frank, he had a little greenhouse and looked like mr greenjeans to me! I'm a subscriber, I like you on FB and my gardening guru was my grandmother in Germany! When I got to visit her (every other summer when I was growing up), I got to enjoy all of her flowers and trees and oh, the strawberries and tomatoes, and plums and on and on! No one in my family did much gardening, so I would have to say that my gardening gurus are the people I have met online, in particular Path to Freedom. I only started gardening a few years ago when produce started coming up with ecoli and stuff like that. This site absolutely blew my mind when I saw the pictures of what they grow in their typical backyard. I am a subscriber to your newsletter and FB. My email starts terry…I have just finished the last book “Omnivore's Dilemma”, so I need something new to read! I never lived where I could put a garden or we moved so much in the military it was impossible to keep anything growing. When I was young I remember my mom takeing in everyons africian violet that was dead or dying. and she just put them by a window in the garage and you wouldn't believe how they grew. now that i am getting older we have moved to tn. and 5 acres. and i an going to start to learn to grow things. I would love this book. Thank you for the chance and this will make you my garden GURU..
My gardening guru is a master gardener that teaches at the vocational center. She teaches horticulture and runs a greenhouse along with the students.She also teaches adults classes and is a landscape consultant. She has her hands in the dirt every chance she gets! Look for tam in your mailing list. Gosh, I loved Thalassa Cruso! She was right up there with Julia Child on my “wanna-be-like-her” list. I always enjoyed listening to Doc and Katy Abraham on the radio. They were a wealth of knowledge! They also had a tv show for a while on the local channel and taught many classes on gardening. I never really had a gardening guru growing up. My mom did plant things and had a few house plants-but nothing extraordinary. I will say she's developed more gardening savvy now and does lovely things outdoors. My grandpa grew tomatoes and had a pear tree, while his neighbor grew parsley. However, my family has always had an affinity to nature and we love our landscaping. Right now, however, I do have a gardening guru-YOU! Thanks for all the inspiring information. I am “connected” through both of your writing avenues…. and I have two gardening heroes/gurus….. my grandmother always had beautiful flower gardens- I have many fond memories of the hours spent “helping her” (I'm sure I was far more hindrance than help!) and my Dad to this day always has a showpiece of a vegetable garden! I like Martha Stewart but I thought that I remember as a kid that Norm Abram came out of the house and did gardening stuff too? LOL. My mother is a master gardener so definitely my mom would be a guru to me. Thanks for playing, everyone! Random.org selected “gram” as the winner of Thalassa Cruso's witty and wise “Making Things Grow Outdoors.” Congratulations, Gram! Interestingly she Theresa is my guru as well. I have a book, “Making Vegetables Grow” which I use like a bible.